Conventional wisdom is correct in that only small amounts of vitamin C are necessary for this function because of its repeated use. The point missed is that the limiting part in nonenzymatic free radical scavenging is the rate at which extra high-energy electrons are provided through NADH to rereduce the vitamin C and other free radical scavengers. When ill, free radicals are formed at a rate faster than the high- energy electrons are made available. Doses of vitamin C as large as 1 to 10 grams per 24 hours do only limited good. However, when ascorbate is used in massive amounts, such as 30 to 200+ grams per 24 hours, these amounts directly provide the electrons necessary to quench the free radicals of almost any inflammation. Additionally, in high concentrations ascorbate reduces NAD(P)H and therefore can provide the high-energy electrons necessary to reduce the molecular oxygen used in the respiratory burst of phagocytes. In these functions, the ascorbate part is mostly wasted but the necessary high-energy electrons are provided in large amounts. In this paper, the words, vitamin C, will refer to the substance C6H6O6 used in tiny doses as a vitamin and an electron carrier. The word, ascorbate, will mean the same substance but when used in massive amounts for its high-energy electrons themselves. This paper is not meant to be an exhaustive review of the subjects of oxidation-reduction reactions, free radical scavenging, electron-transport-chains, or oxidative phosphorylation, etc. Readers are referred to excellent texts on these subjects. Many of the biochemical processes are deliberately simplified. Some intermediate steps are omitted. Certain generalizations are made so that the importance of a very simple but overlooked idea can be described in terms a non-biochemist can understand. The overlooked idea is that massive doses of ascorbate can actually be the source of high-energy electrons used in the process of free radical scavenging and not just an electron carrier used repeatedly in an electron-transport-chain resulting in free radical scavenging. Clinically, a few physicians have found massive doses of ascorbate to be effective in the treatment of a wide variety of diseases. It was apparent to those using ascorbate in these doses that there is some physiologic or pharmacologic action much different from what might be expected of a mere vitamin. Nevertheless, most physicians remained critical of these treatments and remained convinced that the usefulness of ascorbate is only as vitamin C. Many had recognized that one vitamin C function is as a free radical scavenger. In this function, vitamin C donates high-energy electrons to neutralize free radicals and in the process becomes DHA (dehydroascorbate). DHA is either further metabolized, releasing more electrons, or is rereduced back to vitamin C to be used over and over again. This regeneration and repeated use of the vitamin has led to the thought that it does not take much to do its functions. Other nonenzymatic free radical scavengers such as glutathione and vitamin E function in a similar manner. The purpose of taking the nutrients making up the free radical scavengers is ordinarily to replace the small percentage inadvertently lost. Much of the original work with large amounts of ascorbate was done by Klenner who found that most viral diseases could be cured by intravenous sodium ascorbate in amounts up to 200 grams per 24 hours. Irwin Stone pointed out the potential of ascorbate in the treatment of many diseases, the inability of humans to synthesize ascorbate, and the resultant condition hypoascorbemia. Linus Pauling reviewed the literature on vitamin C, particularly its usefulness in the prevention and treatment of the common cold and the flu. Ewan Cameron in association with Pauling described the usefulness of ascorbate in the treatment of cancer. This amelioration of symptoms at a high dosage threshold combined with the knowledge that ascorbate functions as a reducing substance suggested that the beneficial effect was achieved only when the redox couple, ascorbate/dehydroascorbate, became reducing in the tissues affected by the disease. It is a characteristic of oxidation-reduction reactions that their redox potential is determined by the logarithm of the concentrations of the substances and certain constants. The logarithmic effect would explain the threshold; the redox potential would suddenly become reducing in the diseased tissues only when a large amount of ascorbate was forced into those tissues sufficient to neutralize most of the oxidized materials in those tissues. Radicals are molecules that have lost an electron. When a radical escapes its normal location, it becomes a free radical. These free radicals are very reactive and will seize electrons from adjacent molecules. Inflammations whether due to infectious diseases, autoimmune diseases, allergies, trauma, surgery, burns, or toxins involve free radicals. Cells injured by free radicals will spill free radicals onto adjacent cells injuring those cells and generating more free radicals, etc. The body must confine these free radical cascades with free radical scavengers. Some free radicals spontaneously decay and others are destroyed by enzymatic free radical scavengers such as superoxide dismutase and catalase that act on free radicals in such a way that they neutralize themselves without the addition of extra electrons. The remainder must be destroyed by the high-energy electrons carried by the nonenzymatic free radical scavengers. Free radicals that escape all the above mechanisms cause symptoms and damage. It is helpful to remember through all the following descriptions that technically it is the high-energy electron that is neutralizing the free radical, not the free radical scavenger. The free radical scavenger carries the high-energy electron that does the neutralizing. The energy of the electrons which neutralize free radicals comes ultimately, like all energy used by living things on Earth, from the Sun. Plants store this energy by photosynthesis in carbohydrates, fats, and proteins which are then eaten by animals. As animals metabolize these substances, this energy is past from one molecule to another in the form of high-energy electrons which often, but not always, are in association with hydrogens. Together with a high-energy electron, one such hydrogen can be called a hydride anion. As glucose is metabolized, NAD+ (nicotinamide adenine dinucleotide) is reduced to NADH (the bolded H is to emphasize the included high-energy electron). The high-energy electron in the hydride anion (H) is added to the NAD+. The most critical but generally unrecognized fact here is that NAD+ can be reduced to NADH only at a limited rate by the addition of the hydride anion with its high-energy electron derived from the metabolism of carbohydrates, fats, or proteins. Therefore, this NADH is not without cost. Moreover, the energy it carries must be shared among several other critical functions. Most must be used in the process of oxidative phosphorylation to make ATP (adenosine triphosphate) which is used as a source of energy by the various tissues of the body. When phagocytes engulf pathogens into its vacuoles, NADPH (nicotinamide dinucleotide diphosphate, reduced form) provides the high-energy electrons the phagocytes need to make the oxidizing substances (radicals) with which they kill various pathogens. The process of making the necessary oxidizing substances is called the respiratory burst. Paradoxically, the first oxidizing substance, superoxide, (O2+), in the respiratory burst is made by the reduction of molecular oxygen (O2) by NADPH. NADP+ is rereduced back to NADPH in the hexosemonophosphate shunt. Glucose is metabolized for the source of the high-energy electron. This process is also rate- limited and the glucose comes from the metabolism of carbohydrates, fats, and proteins. Therefore, NADH and NADPH have a common source of energy and can be made available only at some limited rate. As these high-energy electrons are used up within the phagocytes, the phagocytes are unable to produce more oxidizing substances within their vacuoles to kill pathogens. Some of the previously made oxidizing substances leak from within the vacuoles into the cytoplasm thereby becoming free radicals. With the exhaustion of the high-energy electrons, the nonenzymatic free radical scavengers cannot be rereduced. The free radicals damage the phagocytes and interfere with phagocytosis. The phagocytes bog down in their own oxidizing substances. To understand the unusual function of massive doses of ascorbate, let us follow the most important pathway whereby the extra electrons are passed off to the free radicals thereby neutralizing them. Follow the high-energy electron in the hydride anion through all this process. Certain nutrients that could be limiting factors in all this will be mentioned along the way. NAD(P)H reduces oxidized flavin adenine dinucleotide (FAD+), to reduced flavin adenine dinucleotide (FADH2), and becomes NAD(P)+ again. FADH2 reduces oxidized glutathione (GSSG) to reduced glutathione (GSH). (Part of NAD(P)H is from vitamin B3, and part of FADH2 is from vitamin B2). The high-energy electrons of reduced glutathione (GSH) can directly reduce some free radicals. But also, some reduces dehydroascorbate back to ascorbate. In the process the GSH is oxidized back to GSSG. Two hydride anions are added to the dehydroascorbate reducing it back to vitamin C. (The enzyme glutathione peroxidase and its coenzyme selenium catalyze these reactions). Ascorbate (C6H6O6 or C6H6O6H2, the bolded and separated H2 is to emphasize the hydrogens containing the high-energy electrons) differs from dehydroascorbate (C6H6O6) in that it has two extra hydrogen atoms with two high-energy electrons in its molecular structure which it can donate to reduce free radicals. The high-energy electrons of ascorbate, C6H6O6H2 can directly quench free radicals. But some may reduce tocopheryl quinone (an oxidized form of vitamin E) back to à-tocopherol (vitamin E). Some high-energy electrons are passed to the à-tocopherol and then quench free radicals. The point I want to emphasize is that these free radical scavengers cycle from the reduced form carrying the hydride anion with the high-energy electron back to the oxidized form lacking the hydride anion. Although there is a little loss, most of the free radical scavengers are rereduced and used over and over again. This repeated use with only a little loss is why it ordinarily takes a small amount of these substances to do their electron carrying function to the maximum allowed by the availability of the hydride anion. The limiting factor in all this, in a well nourished person, is this rate-limited availability of the hydride anion with its high-energy electron. The body can make NAD(P)H available for this purpose only at a limited rate. When the need to scavenge free radicals exceeds this rate, then symptoms, damage, and ageing occur. Adding more vitamins and other nutrients, even the ones noted as being free radical scavengers, notably vitamin C, vitamin E, vitamin A (especially á-carotene), cysteine, selenium, etc. do not, under ordinary circumstances, add much to all this. All these free radical scavengers are cycled several times an hour when a person is sick. The NAD(P)H keeps rereducing these free radical scavengers so they are used repeatedly. Taking of the usual amounts of nutrient free radical scavengers only assures that there are no critical deficiencies that would limit this free radical scavenging electron-transfer chain described above. Still there is a normal limit to the free radical scavenging ability of this system. . . .
. . .except. . .ascorbate, C6H6O6H2 used as the source of electrons, not just as the electron carrier, can change all this. The C6H6O6H2 used in massive doses substitutes for the limited availability of the NAD(P)H. The C6H6O6 part of the C6H6O6H2 used this way is thrown away; the C6H6O6H2 is only used for the electrons it carries. Amounts of 30 to 200+ grams of C6H6O6H2 provide ample high-energy electrons to directly scavenge the large amounts of free radicals generated in disease processes and provide enough high-energy electrons to rereduce NAD(P)+, FAD+, GSSG, tocopheryl quinone, etc. back to their reduced forms. Lewin pointed out that although the C6H6O6H2/C6H6O6 redox couple is usually reduced by GSH at the concentrations in which these substances are ordinarily present, when C6H6O6H2 is present in large concentrations, it will reduce GSSG to GSH. The usual direction of the redox reaction is reversed and the C6H6O6H2 supplies the high-energy electrons reducing the GSSG. If there was some substance that was cheaper, better tolerated by the body, and had fewer nuisance problems associated with its administration than sodium ascorbate, NaC6H6O6H, intravenously and intramuscularly, or ascorbic acid, C6H6O6H2, orally, I would use it. So far, C6H6O6H2 and NaC6H6O6H are the premier sources of high-energy electrons and therefore the premier free radical scavengers. The dehydroascorbate, C6H6O6, part of the ascorbate, C6H6O6H2, used this way is excreted rapidly in the urine or metabolized further by the body. Although the complete pathway has not been described and involves some uncertainty, it is known that certain breakdown products of dehydroascorbate supply even more high-energy electrons. Bearing in mind that it is the high-energy electron that is doing the free radical scavenging, one can see that animals which can synthesize ascorbate within themselves have a higher amount of the electron carrier available and will not ever suffer from scurvy. However, the high-energy electrons ultimately come from the same sources as in humans. Ascorbate producing animals still must make the ascorbate and the high-energy electrons available by various metabolic steps using glucose. This process is rate- limited. Comparing the ability of a human to make C6H6O6H2 to a dog is like comparing a human’s ability to fly in a Concorde with a humming bird. The human can make enormous amounts of C6H6O6H2 in his chemical plants. Humans just have to learn to use it properly. The usefulness of ascorbate in treating diseases involving free radicals bears no relationship to how much vitamin C animals make or consume unless one is satisfied with achieving only the level of health of that animal. We are using a natural substance in an unnatural way to achieve these effects. It is the high-energy electrons, not the ascorbate, that is most important here. The mechanism I am describing is a pharmacologic effect of the high-energy electrons carried by the C6H6O6H2 that transcends the normal ability of any species of animal to ameliorate or conquer diseases involving free radicals. Any disease process that involves free radicals can be ameliorated by the high-energy electrons carried by ascorbate when used properly in massive doses. It is true that there are certain logistic problems involved in delivering the massive doses of C6H6O6H2 containing the enormous numbers of electrons sufficient to quench the excessive free radicals of certain severely toxic diseases but it is surprising what massive doses of ascorbate will accomplish. Calculations of the total amount of ascorbate in a healthy person (pool size) with an intake of about 100 milligrams of vitamin C per day is roughly 2-3 grams and the turnover half time is about 20 days. When a person who when well can ingest only 15 grams of ascorbic acid per 24 hours before it causes diarrhea, can take over 200 grams in 24 hours when ill with mononucleosis, one obtains a suggestion of the numbers of extra electrons involved. If 185 grams (200 minus 15) extra is used, whatever the amount of high-energy electrons carried in that divided by the amount in 3 grams means that if ascorbate was the only carrier of electrons (which it is not), that 3 grams of ascorbate would be rereduced about every 23 minutes. There are so many facts such as the amount of high-energy electrons carried by the other free radical scavengers that this number is almost valueless. Still, it makes one think in terms of minutes to a few hours for the rereduction of all the free radical scavengers of the body when one is seriously ill. This emphasizes the futility of using vitamin free radical scavengers in the doses described in the RDA to provide the necessary high-energy electrons. Unfortunately, the fire goes out of control and it is not possible to pump the water out of the well at a rate fast enough to put out the fire. The arrival of more neighbors does no good because there are already enough for the three bucket brigades. A couple of neighbors run from their homes with their buckets full of water but that does not help very much. Then the fire engine roars up and puts out the fire with hoses that draw water from the fire engine. The firefighters do not rely on the water from the well. We have to stretch the analogy here a little but imagine microscopic buckets with C painted on their sides carrying the water out of the fire hose. The little buckets are wasted. Their only function is to carry the water. Free radical scavenging is a very dynamic process. The nutritional free radical scavengers in the diet, including vitamin C, are not for the purpose of providing the large number of high- energy electrons necessary to meet the rate with which free radicals are made. The purpose of dietary free radical scavengers is to replace those scavengers incidentally lost. The process of reducing a free radical does not destroy a free radical scavenger if it is rereduced before being further broken down. The free radical scavengers are intermediaries. It is up to other metabolic processes to provide the high-energy electrons with which the free radical scavengers reduce free radicals. The rate at which free radicals are formed becomes excessive and causes symptoms when it exceeds the rate of reduction of those free radicals. Part of the reduction is spontaneous and part is enzymatic. The remainder must be reduced by the high-energy electrons carried by the nonenzymatic free radical scavengers. Pauling L. Vitamin C and the Common Cold. W.H. Freeman and Company, San Francisco, 1970, Linus Pauling, Vitamin C and the common cold, Can Med Assoc J. 1971 Sep 4; 105(5): 448, 450. PMCID: PMC1931292. 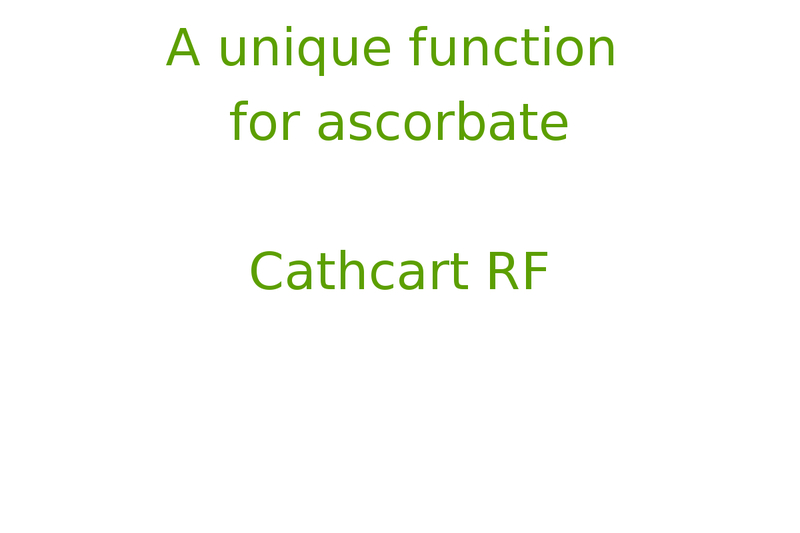 Cathcart R.F. Vitamin C: the nontoxic, nonrate-limited, antioxidant free radical scavenger. Medical Hypotheses, 18:61- 77, 1985. Cathcart R.F. Clinical trial of vitamin C. Letter to the Editor, Medical Tribune, June 25, 1975. Cathcart R.F. The method of determining proper doses of vitamin C for the treatment of diseases by titrating to bowel tolerance. The Australian Nurses Journal 9(4):9-13, Mar 1980. Cathcart R.F. The method of determining proper doses of vitamin C for the treatment of disease by titrating to bowel tolerance. J Orthomolecular Psychiatry 10:125-132, 1981. 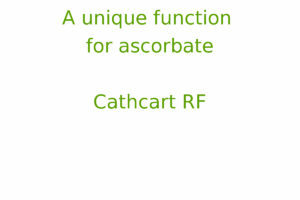 Cathcart R.F. C-vitaminbehandling till tarmintolerans vid infektioner och allergi. Biologisk Medicin 3:6-8, 1983. Cathcart R.F. Vitamin C: titrating to bowel tolerance, an-ascorbemia, and acute induced scurvy. Let’s Live (Japan) 16:9, Nov 1983.